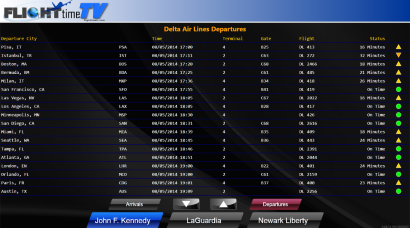 To meet the needs of your customers, Flight Time TV offers the flexibility to choose how to display the flight information. Whether the flight information is displayed on a single screen, digital signage display or broadcast over the internal TV network, a solution is available for your customer. The ability to display your logo or your customer's logo on the screen when using the Flight Time TV interface is available. When integrating the XML or RSS feed into an existing digital signage system, you have the ability to fully brand the display, depending on the capabilities of the digital signage system. By working with Flight Time TV you are adding another beneficial service to your portfolio that will allow you to better serve your customers, diversify your products and generate an additional revenue stream. Flight Time TV has feeds for airports world wide, opening markets in Africa, Asia, Europe, Oceania, North America and South America. Please contact Flight Time TV today for more information and to find out how a partnership can benefit you.